Caption slip reads: "Photographer: Mitchell. Date: 1952-09-29. Reporter: Brown. Assignment: First haircut. 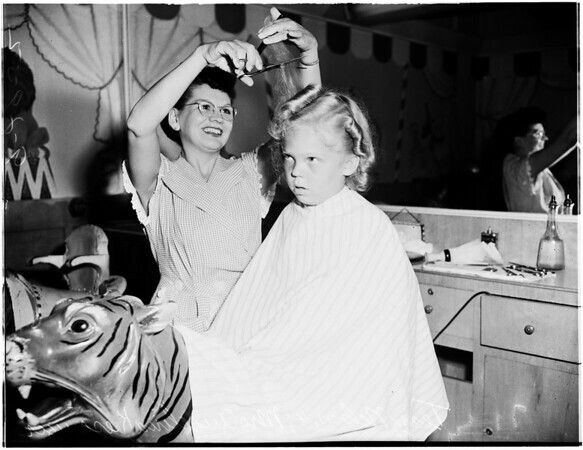 15-16: Before -- Terry Nelson, 4, sits in Bullocks children's barber shop as curls are readied for cutting by Mrs. Angelina Kessinger, barber. 59: After -- Terry, with his locks cut to five inches, and Mrs. Kessinger. 60: Mrs. Kessinger shows clipped curls to Terry's mother, Mrs. Margaret Nelson, 3604 East 52nd Street, Maywood (right), as Terry (center) grins".